Jay Grodner, the Chicago attorney caught ‘keying’ the car of a U.S. Marine facing deployment, pled guilty in a plea deal worked out by States Attorneys and himself today in the courtroom of Circuit Court Judge William O’Malley, a former marine himself. Seeing the damage done to his cars paint, McNulty called the Police and Grodner was cited for misdemeanor criminal damage to private property. Another States Attorney taking the case more serious, decided to prosecute it fully. At a December 31, 2007 hearing, Grodner initially failed to appear, prompting the judge to issue a warrant for his arrest immediately. Before it could be executed, Grodner showed up citing busy traffic and making a wrong turn for his tardiness. He was chastised by the judge for being tardy and making lame excuses. In the meantime, McNulty was deployed, as planned. On his behalf, States Attorney’s were present in today’s court presided over by Circuit Court Judge William O’Malley, a former Marine lance corporal from the early 1960s. Having failed in his effort yesterday to gain a continuance in the case, Grodner was again late for court, calling in after court convened saying he would be about a half an hour late as he was waiting for the media to leave. Prior to the call, Judge O’Malley increased his bond to $20,000.00, and put out a warrant for his arrest saying, “if he does show up he will be taken into custody, and if he doesn't he is fair game for any law enforcement agency that wants to pick him up,” according to eyewitnesses in the Court Room who posted their accounts of today’s trial on Blackfive, a popular Veterans blog, who first broke this story nationally. Brought back out into the Court Room to read the plea deal worked out into the record, Judge O’Malley asked Grodner if he had committed the acts he as accused of. Instead of answering, Grodner first hemmed and hawed forcing Judge O’Malley to raise his voice to elicit a yes or no from him. Grodner finally admitted his acts of vandalism to the Judge and it was entered into the record. According to the plea deal, Grodner must serve 1 year Social Service Supervision, pay restitution of 600 dollars to Social Services, which would go to the Injured Marine Semper Fi fund, to be paid by February 25th, 2008, and $50/month in supervision fees. Reportedly in an angry voice, Judge O’Malley then scolded Grodner saying that the Marine license plates Sgt McNulty had were not vanity plates or about ego, but that the proceeds go toward the Marine and Navy scholarship fund for the children of fallen soldiers, sailors and marines. These Marines protect his very existence "so people like you can enjoy their freedom." 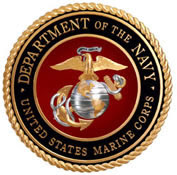 He further said that the reason there were so many in the courtroom and so much public interest is that the Marines have a tradition since 1775 that "No Marine gets left behind." Several Hoorahs were voiced from the crowd of uniformed and civilian supporters of Sgt McNulty present in the courtroom. Chicago Attorney, Jay R. Grodner, once implicated in Attorney Fraud by the Illinois State Supreme Court, is more fortunate than he may realize in accepting this mild deal today. Had he committed such an act against some of the Marines I knew when I was in the Military, he would have entered the Court Room with the assistance of crutches and missing some front teeth.